Epigenetic tags on DNA from fathers’ sperm linked to children’s autism symptoms. In a small study, Johns Hopkins researchers found that DNA from the sperm of men whose children had early signs of autism shows distinct patterns of regulatory tags that could contribute to the condition. The opensource study is published in the International Journal of Epidemiology. The team states that autism spectrum disorder (autism) affects one in 68 children in the U.S. Although previous studies have identified some culprit genes, most cases remain unexplained. However, the majority of studies agree that autism is usually inherited, since the condition tends to run in families. In this study, investigators looked for possible causes for the condition not in genes themselves, but in the epigenetic tags that help regulate genes’ activity. In the current study the researchers wanted to investigate what happens before someone develops autism. If epigenetic changes are being passed from fathers to their children, the team theorised that they should be able to detect them in sperm. In addition to being easier to sample than egg cells from women, sperm are more susceptible to environmental influences that could alter the epigenetic tags on their DNA. The team assessed the epigenetic tags on DNA from sperm from 44 dads. The men were part of an ongoing study to assess the factors that influence a child early on, before he or she is diagnosed with autism. The current study enrolled pregnant mothers who already have a child with autism and collects information and biological samples from these mothers, the new baby’s father and the babies themselves after birth. Early in the pregnancy, a sperm sample was collected from fathers enrolled in the study. One year after the child was born, he or she was assessed for early signs of autism using the Autism Observation Scale for Infants (AOSI). When the team looked at which genes were near the identified sites, they found that many of them were close to genes involved in developmental processes, especially neural development. Of particular interest was that four of the 10 sites most strongly linked to the AOSI scores were located near genes linked to Prader-Willi syndrome, a genetic disorder that shares some behavioural symptoms with autism. Several of the altered epigenetic patterns were also found in the brains of individuals with autism, giving credence to the idea that they might be related to autism. The team plans to confirm its results in a study of more families and to look at the occupations and environmental exposures of the dads involved. The researchers note that there is currently no genetic or epigenetic test available to assess autism risk. 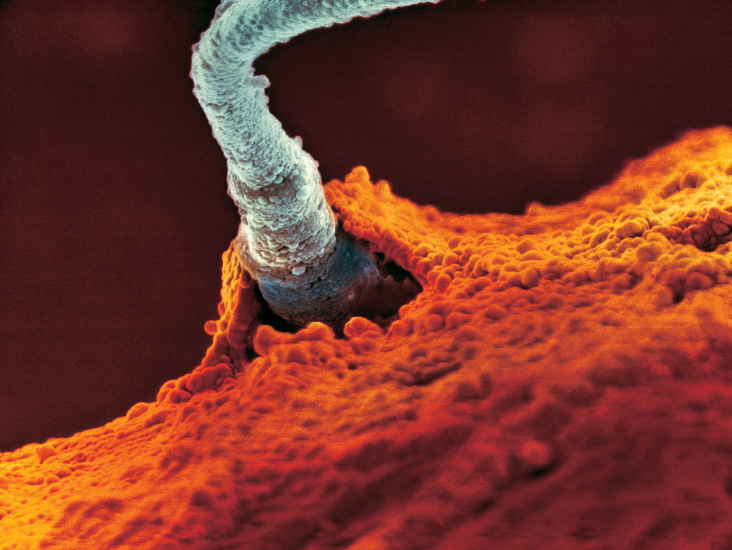 The moment of fertilization, revealed by an ultra high scanning electron microscope. In the race to reach the egg cell, up to 500,000,000 human sperm set out on the perilous journey to the Fallopian tube, which only 100 to 150 sperm survive. Credit: Lennart Nilsson, 1990.